Description: Bauer Rainbow Pin - Done in multi-pastel colors and set in silvertone. 2 1/4" x 1" . 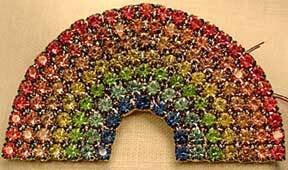 Great for artists, gay pride, "Wizard of Oz" fans and rainbow lovers everywhere.